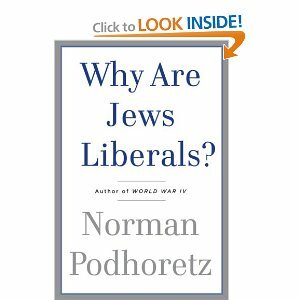 As I said in my Sunday post, I recently read a book called Why are Jews Liberals? by former Commentary editor Norman Podhoretz. I found it fascinating and would recommend it to anyone with an interest in this area. I found it particularly fascinating where politics and religion intersect. There were several things that prompted thought for me. As I said, Podhoretz briefly traces the history of the Jews throughout the church age — the time when the franchise for bringing God’s word to the world was shifted from the nation of Israel to the (mostly) Gentile Body of Christ. Instead of a particular nation that was tied to physical ancestry, the truth of Salvation is now disseminated through various gentile “client” nations where enough freedom exists for the gospel to be preached, and for people to believe freely and be able to gather together to study God’s word and grow in grace as believers. The church age is a time when, as Romans says, there is no Jew nor Greek, no slave or free, no male or female, but all (Believers) have equal privilege and opportunity as members of the Body of Christ. The first client nation was the Roman Empire, where the early church flourished and eventually got distorted into a state religion. That religion dominated the middle ages and much of Western History thereafter and unfortunately some of its leaders had what I consider to be very odd ideas. Whereas the muslims were commanded in their koran to kill the Jews, and drive them out (if they could) Christians were not. But that didn’t mean they were to treat them well. Indeed, according to Podhoretz, it was from St. Augustine that the notion of the Jews as a “witness people” began (though this is not obvious from a quick investigation through Google) (he did cite his reference but I didn’t make a note of it when I had the book). That is, the Jews were destined “to live as testimony to both evil and Christian truth, but were not to be killed, for like Cain they bore a sign. (14) ‘Let them live among us, but let them suffer and be continually humiliated’. In obedience to this concept, then, the Catholic Christians of Western Europe gathered Jews into “ghettos”, not to kill them, but not to give them any opportunities either. Unless he converted to Christianity, the Jew had to wear specific types of clothing, was not allowed to attend school or hold any job but money lending. Their misery was said to be the proof that Christianity was true. Their misery would be proof that Christianity is true? What a concept! I would think that the proof that Christianity is true lies with the Bible. And only that. The idea that the God of all grace would need to deliberately use someone’s misery to prove the truth of His word just strikes me as … wrong. The fulfillment of that promise is played out starkly in Podhoretz’s narrative. And I’m happy to say that it was the United States that ultimately provided the greatest freedom — and prosperity — the Jews experienced in all their history since the fall of Jerusalem. It’s amazing the number of European Jewish immigrants who came here virtually penniless, were quickly employed — often self-employed — worked their butts off and ended up some of the wealthiest people in our country. Just think: Levi’s began with a Jew (Levi Strauss). Sears, Levy’s Department Store, Goldwater’s, Metro-Goldwyn Mayer, Goldman-Sachs, Calvin Klein, Costco, Starbucks … okay so some of those are current. It’s amazing how many of them are in Hollywood… amazing how many things we take for granted, that are pleasures and blessings of life that have come from Jews in this country. But then, the greatest blessing of all comes from a Jew as well, our Lord and Savior Jesus Christ, who, of course was the one mostly being pointed to in God’s promise that in or through Abraham all the families of the earth should be blessed. This entry was posted in Book Thoughts, Jews and tagged Books, History, Jews on June 8, 2010 by Karen Hancock. To see the proof of His blessings to those who bless the Jews, all we have to do is look back through history. If that is not enough proof for a person, then we are dealing with a fool. The fool who has said their is no God. The Jews have flourished in this country. Why? Freedom!!! In these unsettled times, a look backward shows us many times much more troubled than now. The only difference I see is that we probably have a smaller percentage of positive volition in our nation today than in the past. But then how can I know that is true? As God once said to one of His prophets… I have seven thousand more just like you!!! More proof that God does not need us…we need Him!!! Yet most Jews still reject Him.